BAUDETTE, MN Ice Fishing Paradise! 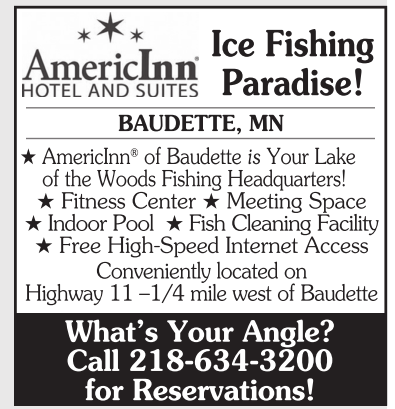 AmericInn ® of Baudette is Your Lake of the Woods Fishing Headquarters! Fitness Center Meeting Space Indoor Pool Fish Cleaning Facility Free High-Speed Internet Access Conveniently located on Highway 11 –1/4 mile west of Baudette What’s Your Angle? Call 218-634-3200 for Reservations! AmericInn ® of Baudette is Your Lake of the Woods Fishing Headquarters! What’s Your Angle? Call 218-634-3200 for Reservations! Lake of the Woods Fishing Headquarter!